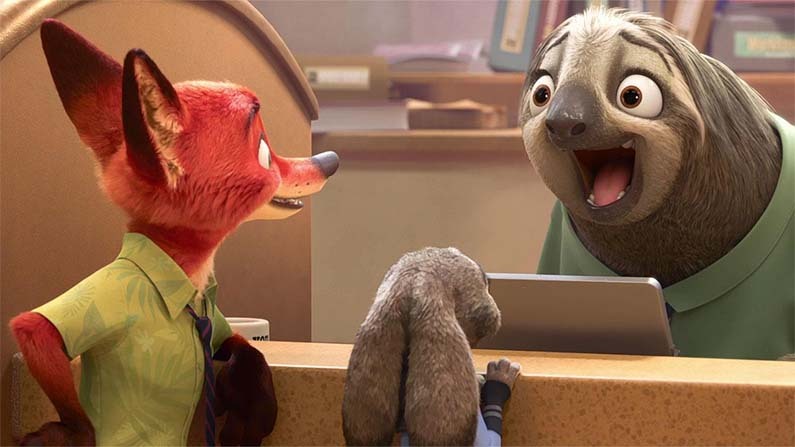 Zootropolis is Disney’s latest kid’s movie and, while it’s animated, you may be delighted to hear that there isn’t a Princess in sight. In fact, there’s no humans in it at all. Every character is an animal in a world where hunter and prey have outgrown their primal killing instincts and learned to live in harmony. 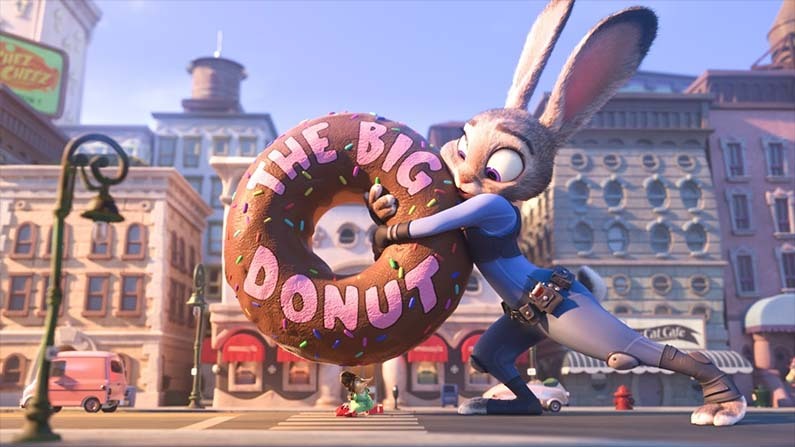 The story follows Judy Hopps (Ginnifer Goodwin), a rabbit raised in her parent’s carrot farm in the country. She has had lifelong dreams to move to the big city, Zootropolis, become a copy and make the world a better place. When the harsh realities of city life hit her, she relies on street smart fox Nick Wilde (Jason Bateman). 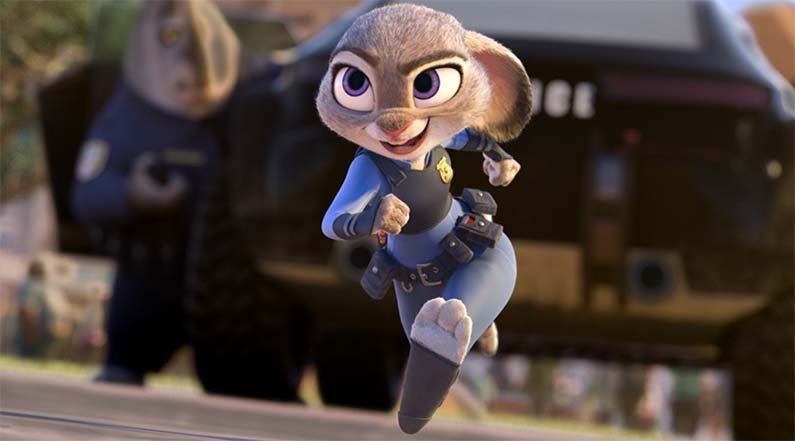 Judy’s desire to establish herself as a cop lead her to investigate the mysterious disappearance of several animals in the different zones of Zootropolis. If the idea of a movie where the lead character believes that everyone can achieve all of their dreams sounds a little too sugary for you, you’ll be relieved to hear that the amount of sarcasm and cynicism from the more world-weary characters balance this out. What is essentially a buddy-cop movie for kids works a treat. The interplay between Hopps and Wilde is perfectly pitched. The support characters are just as developed. Idris Elba’s Chief Bogo is suitably cop-show gruff and Nate Torrance’s camp front desk cop Clawhauser has a wealth of one-liners. Tommy Chong’s spiritual fly infested Yax has some amusing screen time also. Animation artist Raymond S. Persi puts his pen down and voices sloth Flash who steals his screen time delightfully. The film manages to cram in a lot of storyline without overwhelming younger minds. We went with Eve (3 1/2) and Jenny (4 1/2) who both stayed glued to the screen throughout. Watching the mystery of the missing mammals unfolding is very satisfying as the bunny & fox combo piece together the clues. There are a couple of shock moments that even made me jump in my seat, but nothing too scary. You can see how much Disney has benefitted from it’s partnership with Pixar. The sarcasm carefully offsets what could be an overly-sentimal idea. The easter eggs / thinly veiled references include nods to Breaking Bad, The Godfather, a bootleg dvd scene that refers to a whole host of recent Disney movies and a hilarious Frozen reference from Idris Elba. 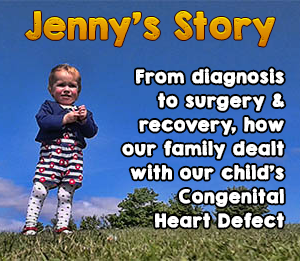 It feels like a very complete story, layered and with a wonderfully gratifying resolution. The film looks beautiful. From the opening scene of a low lit jungle, you know that you’re in for a lush experience. Whether it’s the Amazonian-rainforest zone with it’s deep layers of foliage or the intricate tiny houses in the rodent village, there’s a detailed, colourful, imaginative setting to enjoy. A train journey into Zootropolis (bizarrely reminiscent of The Hunger Games) showcase all the different zones in their splendour. It’s an enjoyable ride. Zootropolis is a sweet and enjoyable movie. You hear about kid’s movies that puts loads in to keep the parents happy and none moreso than this. I think I liked it as much as the children did. Parents may also be happy to know that the characters (apart from Shakira’s Gazelle) don’t sing any songs. No “Do You Want To Build A Snowman” nightmares to follow here. Disney have done a brilliant job here. Perfectly executed and loveable. Highly recommended! This sounds great! Except no songs 🙁 my little ones (almost 4 and 17 mths) love frozen and love music, however if the movie is entertaining enough and this looks like it is, they can just manage to sit through. I cant wait to watch this. This sounds like a fun kids film. Blake is only 15 months so at the moment there is no way he will sit still to watch a film. I will look out for this for when he is a big older. This looks like a great movie (though I read on a different blog that it could be too scary for youngsters. What do you think?) Anything that will weanmy toddler off flipping Frozen can only be a good thing. Gosh ! My nearly 7 year old boy has had 3 nights of nightmares too! We only saw it 4 days ago…. How is your little one now? Like you I did not see the movie so I can’t help him through it…. Any tips on how to get him over it? There are two moments in the film that made our youngest, Eve, jump, but no nightmares so far. There’s a bit in a darkened room when an animal jumps out. It gave everyone a fright. There are a few bits with snarling animals too. This came out earlier in Malaysia under the title Zootopia so my niece and nephews have already seen it! They absolutely loved it… it’s like their new Frozen! We saw this today and loved it! I haven’t see this trailer yet but it looks great, think I will take Justin to go and watch it, great post! Yes I have heard so much positive feedback about Zootropolis and I really want to see the film! Thank god no more Frozen lol.